We all know how regular brushing is important to dental health. If only every toddler would understand this, it will not be so challenging to brush their teeth. Some toddlers insist that they brush on their own, which is not nearly enough to clean their teeth, or others just simply clench their mouth close. Children have the purest of smiles but it’s unfortunate that some of those smiles show teeth that have been destroyed by cavities. Basically, if you have tried every game or gimmick you have read and heard of, and your toddler wont let you brush his teeth, you must hold him down and brush them regardless of protest. Brushing is not an option. It’s a must. But then again, if there is a better way, with less struggles, it’s gonna be easier for both of you. 1. I put a lot of bath toys in the shower so while he is distracted playing, I brush away. 2. Every now and then, we would go shopping for cute toothbrushes. Recently, after our trip to Disneyland, he chose a Mickey Mouse toothbrush for himself. 3. When he is not being cooperative, I tell him “Let’s call Dora!” Then both of us shout a long “Doraaaaaa!” and while his mouth is open, I brush his molars. After that, I say “Time to call Barney!” and while he makes the “eee” sound, I brush his front teeth. It was quite a long wait at the orthopedia’s clinic. Janina was scheduled for a follow-up check-up after her cast was taken out to determine if she still needed rehab or not. 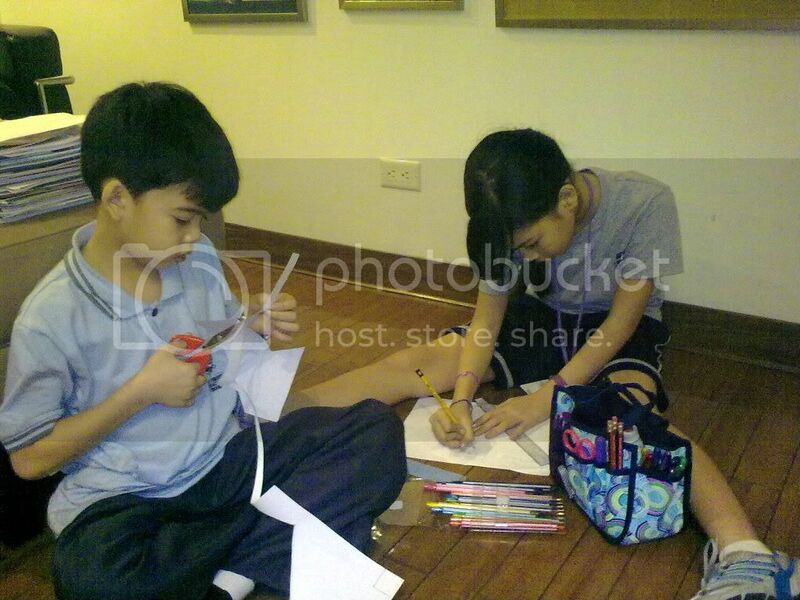 Fortunately, Janina brought her art kit and that kept her and Ryan busy. They were drawing, coloring and cutting, they didn’t even complain about the wait (and normally they would.) Even the adults around them were surprised to see them just quietly working in the corner. I wish I could take credit for this ingenious idea but it was actually Janina who put this art kit together for school. She saw her Tita Mae’s (Perez) Tote-Ally which sells for $25 and thought of using a local bag organizer we bought at SM for just P120.00. 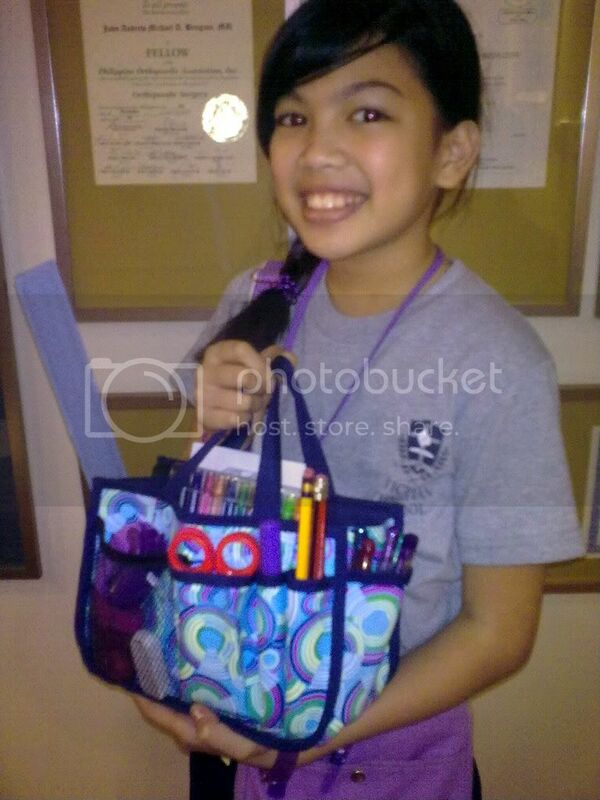 She got her markers, crayons, pencils, scissors and what have you’s and stuffed them in the organizer and she has her own on-the-go art kit which she totes around with her. The first one is an idea I got from one of my best mom buddies, Jeje Quizon. She had the cards laminated (National Bookstore or Copylandia offers this service) and she held them together with a ring. You can also opt to buy the laminating films from the bookstore and iron them by yourselves at home. Isn’t this such a smart idea? I wish I’ve known this earlier. It could have saved me money from buying new flashcards everytime I had a new child. Thanks Jeje for allowing me to share this ingenious idea!